(LOS ANGELES/Nov. 4, 2002) Mark A. Altman, president of Mindfire Entertainment, today announced the feature film company’s acquisition of the enduring science fiction, fantasy, horror and action movie magazine Cinefantastique, launched in 1970. Mindfire will re-launch CFQ in January 2003 under the stewardship of editor-in-chief David E. Williams, the former executive editor of features at The Hollywood Reporter. Prior to joining The Hollywood Reporter, he was senior editor of American Cinematographer magazines. Prior to that he was senior editor of Film Threat magazine. The publishers will be Altman and Mark Gottwald of Mindfire. Altman will also serve as CFQ’s editorial director. Cinefantastique -- known worldwide by readers and fans as “CFQ” -- was founded by publisher and editor Frederick S. Clarke, who passed away in October 2000. 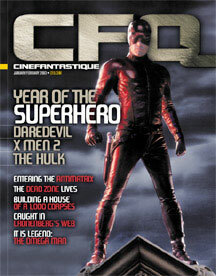 “Cinefantastique was one of the publications that initially sparked my interest in entertainment journalism, and the thorough, no-stone-left-unturned editorial style established by Fred Clarke remains the standard by which all other magazines in this field are still compared,” says Williams, who brings 13 years of publishing experience to the new CFQ. In addition to CFQ, Mindfire has acquired its sister publication, Femme Fatales, which was established by Clarke’s company in 1992 and will be updated as a “sci-fi Maxim,” Altman explains. FF will also be re-launched in early 2003. About Mindfire EntertainmentFounded in 1998, Mindfire Entertainment is an independent production company devoted to film, television and publishing. Mindfire produced the award-winning feature “Free Enterprise,” starring William Shatner and Eric McCormack, the superhero comedy “The Specials,” and recently wrapped production on “The House of the Dead,” a $12 million horror film based on the hit video game series from Sega.